Amsterdam is not just a capital city. It is amazingly beautiful and charming. One can see here not only a lot of cultural and historical sights but also to become familiar with culture of hippies and punks, to see various youth movements. It’s the city of bridges and channels. Many sights can be seen from water. It’s the city of tulips, a big armful of which costs only 5-6 EUR in the central marketplace of Amsterdam. The city is also famous for its nightlife, many clubs, and entertainment centres. Everyone will absolutely like this city. If you decide to see as much interesting things as possible in Amsterdam and its surroundings, you need to get a car for rental to have a truly great vacation. On the bookingcar.ru website you can find recent advantageous car rental deals. If you like any car, you can book it right now. The most popular service is a car rental directly in the airport of Amsterdam. Don’t doubt – travelling around the city is much more interesting by car. Driving on autobahn at a speed less than 60 km/h is a violation and it leads to a € 360 fine. Usually cameras are used to fix speed limitation. Amsterdam, as well as other big cities, suffers from lack of parking spaces. For this reason there is a P+R (Park+Ride) system in the city. Drivers leave their cars at paid parking lots (8 EUR price), which are located in uptown. Cars’ owners go to the centre of the city by public transport. They are also given a special card that makes going by public transport free of charge. Thus, the centre of the city is relieved from enormous amount of cars and citizens gain a certain advantage. There are traditional paid parkings (along the roads), which can be paid via pay machine or special parking disks. The rules for road behaviour in the Netherlands do not have any peculiarities. Though they must be observed not to be largely fined. Low beam must be switched on if there is insufficient visibility. It is allowed to use rear fog lamps only by fog or mist when the visibility is limited to 50 meters. Violation of this rule leads to a serious fine. It is also prohibited to transport children in a car without special children car seat devices. Both front and back seat passengers must fasten their safety belts. Use of a cell phone while driving is punished with a fine. In Amsterdam you can fill a car with unleaded RON95 and RON98 petrol and diesel engine. There are also gas filling stations. If you plan to drive for a long time, note that it is allowed to transport petrol in a fuel can. Filling stations are both automatic and working with staff. To pay fuel you mostly need a credit card. 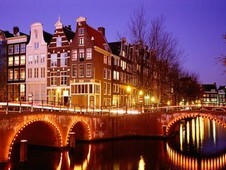 Netherlands from 16 eur a day.